In 1662, Rembrandt van Rijn created this world-renowned painting, which is now in the Rijksmuseum in Amsterdam. The commissioned work shows the heads of the influential Amsterdamer Tuchmachergilde (clothiers guild) at a business meeting. Until 1778, it remained in the Staalhof, which in Rembrandt's time was the headquarter of the guild, where fabrics were tested for texture and colour fastness, in order to ensure the high quality of woven cloth from Amsterdam. In the same year, the painting was moved to the Konstkamer in the Amsterdam town hall. After some further moves, it was exhibited in 1885 in today's Rijksmuseum, where it was presented from 1909 in a specially named Staalmeesters Saal. The painting was cleaned and restored in 1955 for a large Rembrandt exhibition in 1956. As it turned out, the colors had changed significantly over the centuries: The cleaning not only brought forward the bright reflections on the faces, but also the rich colours of the carpet on the table in their original glow. In the same way, the various methods of brushwork clearly emerged: For example, the carpet was painted with strong brushstrokes and spatulas in red, yellow and brown tones, as were the hands of the men. A lot has been researched and published about this painting: Hand and ink drawings by Rembrandt are preserved, which document the origin of the painting. There were investigations of the canvas and color pigments; there are radiographs as well, which show that he had redesigned and corrected the painting several times. Basically, everything had been said and written about this artwork: If not for the scientific linguist and antiquarian researcher Dr. Wolfgang Kosack and his spectacular discovery on a property in Basel, during a trip to Switzerland in 2012: A painting, unbeknownst to the public, with the same motif. While there are some well-known reproductions of this work, they are clearly different from the original: Other than in this painting, which, from the brushwork to the signatures, is a true second painting. 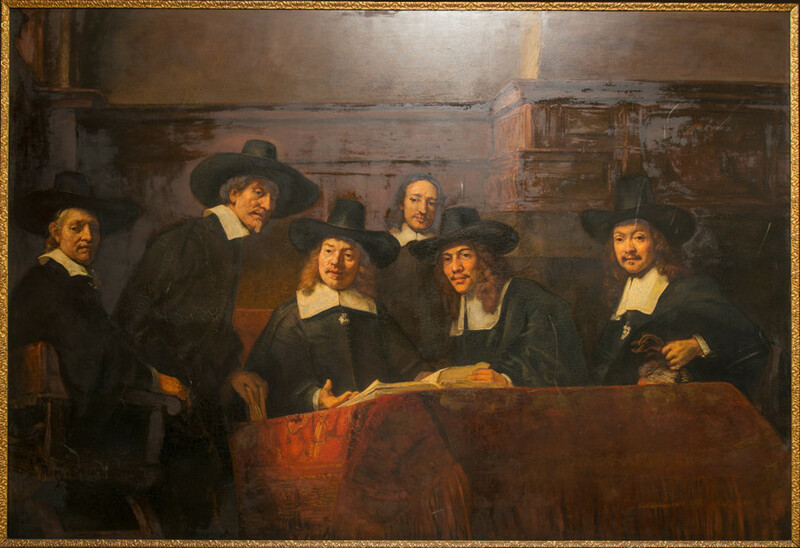 According to the owner, the painting has been in family property for more than 200 years, so that only three possibilities existed: Either it was forged in the 19th century, or it was copied by a disciple of Rembrandt, or the master made this second painting by order of one of the pictured members of the board itself. A forgery in the 19th century was ruled out, as Rembrandt was not very popular at this time, and the great demand for his paintings did not emerge until later: Hence, a copy this detailed wouldn't have been worth the effort. The disciples of Rembrandt also can be excluded, although some experts considered this variant to be most likely until then. According to Dr. Kosack’s study Ein zweiter Rembrandt: “Die Staalmeesters”, Rembrandt did not have any students when the painting was created: As he had to abandon his house and workshop due to a bankruptcy in 1656, and his much more modest new household in the Rosengracht could not accommodate students. Therefore, it is most safe to assume that a copy was ordered by one of the persons pictured, perhaps as a reminder and a status symbol, and to help the chronically cash-strapped artist at the same instance. All details can be found in the study by Dr. Kosack, which also contains a chronological history of these two paintings, and gives an in-depth insight into the life and work of Rembrandt. After the study was published, additional expertises were obtained. Color analysis, conducted in Basel by the Federal Institute for Materials Research (BAM Berlin) proved that the colours - aside from a few restorated spots, and the 19th century varnish - date back to the 17th century, and match the colour spectrum used in Rembrandt's workshop. To date, more than seven scientific studies have already been published, consistently confirming the authenticity of Rembrandt's creatorship. Currently, further investigations of this painting are not planned. The owner decided to offer the painting for sale which is estimated at EUR 900 Millions.